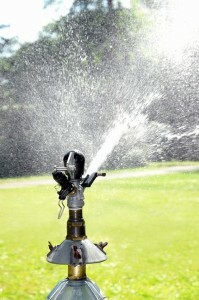 To keep your lawn green and in good condition, it is necessary to stay on top of watering the grass. Of course, there are times where you can’t water the grass yourself, such as when you’re traveling or away from the house for an extended period of time. Without the steady supply of water the yard might eventually begin to dry up, and there is no reason to allow hours of hard work go for nothing. This is why it is so important to utilize a sprinkler system that can be controlled, without actually having to walk outside and turn on the device. This way, it allows for improved functionality and someone won’t have to worry about missing a watering. Want to control your sprinkler while you’re away? 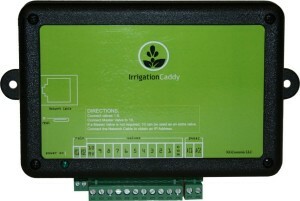 You can with the IrrigationCaddy Web Based Sprinkler Controller. An wifi-based irrigation control system, you can program it even if you’re miles away from home. You can use any computer with a browser, or you can use your smartphone via an app. As it doesn’t any physical buttons, you can’t control it manually. However, your landscaper or gardener can connect to your wifi network and access it. It’s advanced scheduling is very easy to setup. Please note though that this doesn’t come with a rain sensor, although it has a port where you can attach one so you can buy it separately and have total irrigation automation even when you’re away from home for a long time. The equipment connects to a wireless Internet system, so you won’t have cables running throughout the yard and to other locations of the house, simply to water the lawn. 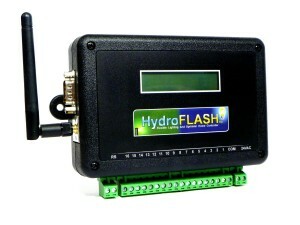 The HydroFlash Lighting and Sprinkler Controller hooks up to a home’s wireless Internet connection and it is even possible to download an application to a smart phone and to control the device from just about anywhere in the world. 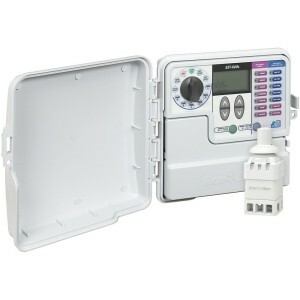 There are four different independent watering programs with different set timers, so even without the application or an Internet connection, it is possible to program this gadget to run when necessary. There are also 16 stations with software configuration, depending on where the equipment is located, so each sprinkler head can actually have its own control system, as different areas of the yard are going to require more or less water throughout the day. There is even a rain delay built into it, so if it rains during the day, the equipment is not going to water the yard, unless the rain did not provide ample amount of water. The RainMachine Smart Wifi Irrigation Controller is able to know the weather forecast and alter its watering schedule accordingly. Gone are the days when the sprinkler goes off in the middle of a rain storm just because it was programmed to go off at that time. There is no reason to pay for this water when nature is taking care of your lawn. 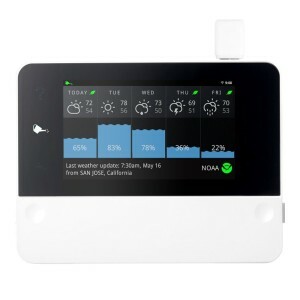 It uses the National Weather Service forecast through a wireless Internet connection in order to see when it is going to rain, how much it is raining and when it should stop. This way, even when it is programmed to function, if it is raining outside, it will not turn on. Plus, there is a simply, 6.5 inch glass touch screen control panel that works beautifully for a user, and it is possible to program up to 12 different zones into the device, so different areas of the yard can receive more or less water during the day and at different time periods and schedules. There is also a seven day forecasting feature built in, on order to determine any possible freeze warnings. This way, it knows if i needs to hold off on watering the plants and it will inform you of any possible freezing dates, giving you enough time to prepare for the frost or other colder weather. For someone who doesn’t want to drop a lot of money on a smart, water and irrigation controller, than the Rain Bird Smart 6-Station 6-Zone Smart Water Timer Controller is an excellent option. It is around $100 less than many of the top competitors, and while it doesn’t have as many features or those bright, glass, digital LCD displays for inside the home,it still is able to control the sprinkler system to a very essential and helpful method. It can be installed both on the outside or inside of the home, depending on the needs of the owners and what they want in terms of look for the equipment. There are six different stations, so it is possible to water different areas of the yard different amounts, at different time periods and for different durations. This way, areas of the lawn that need more water is going to receive this. There is also an easy to read screen with lighted buttons, so it is easy to change the controls of the equipment and to always have the very best features running. It is also durable and long lasting, as the protective casing prevents any moisture and water from entering the device. It is also helps reduce the problem of possible areas of the yard going without water while an owner is gone, as the equipment has six different zone controller features and these can be altered accordingly, based on schedule, so the lawn never has to go without water while a home owner is away from the house. After all, the hard work should not go away while everyone’s away.